One framework for looking at this decision is by comparing Claims 1 and 3 of DET’s U.S. Patent No. 6,282,551. According to the Federal Circuit, Independent Claim 1 is unpatentable, while dependent Claim 3 is good to go. Claim 1 is directed to a method of organizing a “three-dimensional spreadsheet” (i.e., multi-tabbed). However, claim 1 does not particularly claim the notebook tabs — that limitation is added to claim 3. [Saving the tabs in files:] storing said first and second pages of the plurality of cell matrices such that they appear to the user as being stored within a single file. associating the plurality of cell matrices with a notebook identifier, whereby information stored in a first plurality of cell matrices may be referenced from a second plurality of cell matrices. We conclude that under Alice step one, [claim 1] is directed to the abstract idea of identifying and storing electronic spreadsheet pages. . . . [The claim] generically recites “associating each of the cell matrices with a user-settable page identifier” and does not recite the specific implementation of a notebook tab interface. Claim 1 of the ’551 patent is therefore not limited to [a] specific technical solution and improvement in electronic spreadsheet functionality . . . Instead, claim 1 of the ’551 patent covers any means for identifying electronic spreadsheet pages. By implication, Claim 3 is patent eligible because it includes the limitation that the cell matrices (pages) are associated with notebook identifier (a tab). I personally don’t see how claim 3 adds “something more” in a specific enough manner to transform the claim 1 into a patent eligible invention. When considered as a whole, and in light of the specification, representative claim 12 of the ’259 patent is not directed to an abstract idea. Rather, the claim is directed to a specific method for navigating through three-dimensional electronic spreadsheets. The method provides a specific solution to then-existing technological problems in computers and prior art electronic spreadsheets. The specification teaches that prior art computer spreadsheets were not user friendly. . . . The Tab Patents solved this known technological problem in computers in a particular way—by providing a highly intuitive, user-friendly interface with familiar notebook tabs for navigating the three-dimensional worksheet environment…. The invention was applauded by the industry for improving computers’ functionality as a tool able to instantly access all parts of complex three-dimensional electronic spreadsheets. Numerous contemporaneous articles attributed the improved three-dimensional spreadsheets’ success to its notebook tab feature. Representative claim 12 recites precisely this technical solution and improvement in computer spreadsheet functionality. The claim recites specific steps detailing the method of navigating through spreadsheet pages within a three-dimensional spreadsheet environment using notebook tabs. . . . The claimed method does not recite the idea of navigating through spreadsheet pages using buttons or a generic method of labeling and organizing spreadsheets. Rather, the claims require a specific interface and implementation for navigating complex three-dimensional spreadsheets using techniques unique to computers. There is lots more to think about with this case, but this is enough for one post. Waiit, how are these two patents even an issue anymore? 5,590,259 is a pre-gatt patent, so it has a term of 17 years from issue date. It issued Dec 31 1996. So it expired Dec 31 2013. It has been expired for five years, how is this court case not dismissed because the patent has expired? 6,282,551 is post-gatt, so it gets 20 years from earliest claimed filing date. The earliest claimed filing date is 1992. So it would normally have expired in 2012. So barring a 6+ year patent term extension adjustment, it too has long since expired. So why is it also not dismissed as “patent expired, no case left”? This decision helps answer the question “What is considered an improvement to computer functionality?” (MPEP 2106.06(b) ) To figure that out, you would have to decide what a computer does already and what would improve it. At its lowest level of abstraction , a computer stores, moves and transform bits (see e.g. Turing’s paper tape computer). Just 0’s and 1’s, nothing more. From bits we move up to bytes (group of 8 bits) and almost all general purpose computers store, move and transform bytes. From bytes we move groups of bytes which represent characters (text) or numbers. Most but not all real general purpose computers manipulate text or numbers. From single characters or single numbers we move up to rows and columns of characters or numbers (i.e. spreadsheet or table). Based on claim 3 and Enfish, it looks like the courts regard improvements to working with tables of characters or numbers as improvements to general purpose computers. The key seems to be your invention should work with bits, bytes, characters, numbers, or tables of characters or numbers, without regard to the content. Based on claim 3 and Enfish, it looks like the courts regard improvements to working with tables of characters or numbers as improvements to general purpose computers. First, just another friendly reminder to everyone that Enfish didn’t actually improve anything. The claims were invalidated as obvious. Second, tables of characters or numbers are abstractions. They are not eligible for patent protection. “Improving” such things is, logically, also not eligible subject matter for patenting. The bizarre situation we are dealing with now where “on a prior art programmable computer” somehow changes everything is the direct result of some unsupportable created-out-of-thin-air CAFC decisions that would never hold up today. LOL – care to dig deeper into what that eventual holding means for the distinction between patent eligibility and patent ability? To borrow Malcolm’s meme, what exactly (and I mean exactly) is the objective physical structure of such a “real” general purpose computer? The answer is that there are a zillion different such structures out there and the actual software that these b0t t0m feeders wrote will work on less than 0.0001% of them. Which is a big part of the problem with all of these junky software claims (but certainly not the only part). While the “do not have a dialogue count filter” holds the first response, let me tell you Malcolm, that your “answer” is self-defeating to your desired Ends. IF there BE a “zillion different such structures,” then there BE NO actual single structure, and the use of the term is not appropriate. In your hurry to be glib, you buried yourself. OF COURSE. Content consumed by persons is abstract. Using a spreadsheet is a series of abstractions. Greg Chickenshirt DeL: it is beginning to dawn on the CAFC that the SCotUS has lost interest in §101. This is both good and bad. It is bad in that the worst of Mayo/Myriad/Alice will stay on the books indefinitely. The Scotus has not lost interest in 101. They have lost interest in entertaining the whims of the world’s richest and most entitled whiners when it comes to monopolizing information (like correlations) and logic using the patent system. Mayo is never going to be reversed, Greg. If you’ve got an argument for eliminating the prior art from eligibility considerations that doesn’t require radically changing some other aspect of the US patent system, then make it. If you don’t have one, then for gob’s sake quit your insufferable whining and mewling. You’re p@ thetic. At least come out and say that you think people should be able to own non-0bvious correlations for 20 years because otherwise nobody will be motivated to make correlations. Go ahead and say it, Greg! You’re a very serious person after all. You’ll be able to convince everybody that you’re right, even those little people who aren’t as smart as you and who will never, ever come close to owning one of your wonderful correlation patents. the CAFC realizes that it can distinguish those cases into obscure insignificance now, and the SCotUS will not interfere. Lookie! Greg is doing some of dat ol’ time pendulim swingin! Patent law doesn’t work that way, Greg. This is a one-way ratchet, for obvious reasons. For goodness sake please open a window and get some fresh air, will you? Greg DL : the CAFC realizes that it can distinguish those cases into obscure insignificance now, and the SCotUS will not interfere. Part of the reason this comment is so hilarious is that we 0ld-timers (LOL) remember the last time the CAFC tried to “distinguish” an aspect of patent law into obscure insignificance. That was section 112(f). Before that it was section 101. Before that it was section 103. How’d those efforts work out for the CAFC? Now, it’s possible that Greg is cheerleading here for the entry of full-blown Trumpism into patent law, i.e., a situation where facts and reason take a back seat to unadulterated greed and grift. I recognize that as a possibility. That’s one of the reasons I never stop highlighting the ceaseless efforts of the worst attorneys ever (and their incredibly sc u m my clients) to hijack the patent system for the sole purpose of lining their own pockets at the expense of everyone else. Choose your sides wisely, Greg. One life to live. Are you going to spend it here mewling incoherently on behalf of a tiny tiny tiny group of well-heeed jagoffs or are you going to actually make an argument that the US patent system was set up to enable rich people to monopolize correlations and logic because daddy likes it that way. You’re a very serious person after all. I suppose we only have to look at the devastating impact that Mayo has had on the identification of new correlations. Show us the stats, Greg! The suspense is k i ll ing us. Your cognitive dissonance runs amuck, Malcolm. You’ve become so unhinged it’s actually hilarious to read your comments. I picture you wearing a t-shirt with three wolves howling at the moon. it’s actually hilarious to read your comments. I try to make them enjoyable. It is a blog, after all. If I wrote them out “straight” in a brief directed at immolating your junk patent, you wouldn’t find my arguments hilarious at all (unless you like spending a lot of money on lawyers who are going to fail miserably). Haha. Yes, you do get the sense of how much of a legend he feels he is. More than just a little like Trump — oblivious as to his own negative impact and perpetually thinking himself above the rules for others. If you’ve got an argument for eliminating the prior art from eligibility considerations that doesn’t require radically changing some other aspect of the US patent system, then make it… At least come out and say that you think people should be able to own non-0bvious correlations for 20 years because otherwise nobody will be motivated to make correlations. If they’re non-obvious, then whether prior art is considered or not for eligibility wouldn’t make a difference, since they’d pass either way, no? I think a better way to look at it would be to consider such correlations to be merely discovered, but pre-existing, laws of nature. I… consider such correlations to be merely discovered, but pre-existing, laws of nature. Well, sure, if one actually claims literally nothing more than the bare correlation, then this is excluded under §102 because the correlation natural phenomenon had been in public use for more than one year before the filing date. When the correlation is incorporated into a diagnostic method, however, and the method is claimed, this really ought to be a patentable invention (a “a patent-eligible application of such a law” as the Mayo Court styled it, 132 S. Ct. 1289 at 1294). (1) Just to be clear, I mean 7.3.1 to describe what the law should be, not what it is. I freely concede that Mayo forecloses what I said in 7.3.1. (2) I do not mean to be understood as defending the patentability of the claims at issue in Mayo. Those were badly drafted, and deserved to fail under §102 (although I still maintain that they ought to have survived §101 challenge). I disagree. It is fine to say that “you’ve got preexisting administering steps, preexisting determining steps, and – if we take the correlation as also preexisting – then the prior art teaches everything in the claim,” but that gets really sloppy about what “the prior art” means in the obviousness context. For obviousness purposes, it is not enough that a teaching qualify under §102. It has to be analogous art—i.e. art that is familiar to the notional person of ordinary skill. Assuming that the patent itself constitutes the first public disclosure of the natural correlation, this fact is not familiar to the PHOSITA, so the obviousness of applying that natural correlation does not sort out as easily as your quote above would have it. [Y]ou’ve got preexisting administering steps, preexisting determining steps, and – if we take the cuorrelation as also preexisting – then the prior art teaches everything in the claim. This was the analysis that the Court rejected from Justice Stevens’ dissent in Diamond v. Diehr, 450 U.S. 175, 204 (1981). A nice reminder to pay attention to the individual members of the Court and how certain individual members were/are more than willing to rewrite (including outright ignore) the words of Congress when it comes to reaching a desired Ends. Because …. ? Greggy Weggy says so? Or …? How do you justify turning practitioners of the prior art into (LOL) patent infringers (?!?) just because they think or write about some fact that you (or someone else) transformed into words and put into the public domain? I’d love to hear the argument. I’d also love to hear how you get around the First Amendment issue. Don’t forget to put down the crack pipe first. But somehow Greg thinks you can un-exclude the 102 issue with claiming a fact by describing the prior art, e.g., drinking milk. He’s a very serious person, folks! And this is all so very nuanced. Sure it is. You do know that such happens ALL THE TIME in all art units, right? This is due at least in part to the fact that there are fundamental differences between 102 and 103, and that 103 is NOT a mere aggregation of 102 references. Only G0d works from nothing, mere man must always work with building blocks of what was before. Your view implicitly expands 102 into 103 and makes nothing patentable. Sequenom was a “bare” correlation that people are still screamin’ about. Hm, if Sequenom really had claimed nothing more than the bare correlation, I would not be so bitter about that case. If they had really claimed “a naturally existing correlation, wherein the correlation comprises the presence of SEQ ID NO:3 on a cell free fetal DNA sample” I would not much mind. As it happens, the claim required drawing a serum sample and amplifying a gene by PCR, and these things are not correlations. In other words, the claim required more than the bare correlation. A tiny bit of willingness to understand goes a long way, AiD. Otherwise you end up looking like a dullard or (like Greg) a chickenshirt who refuses to engage the issues that are planted right in front of his mug. It’s your choice, at the end of the day. …I meant that as a suggested starting point for people like Greg. Be honest about your motivations! And straight up about it. Just admit that you think the patent system should be a tool for protecting correlations. Currently our system does not allow you to do that, as everyone who is keeping up knows very well. In fact, our patent system has never allowed you to do that. Why? Because it’s a terrible idea all around and there are First Amendment problems to boot. Now, if you want to forbid people from considering the relationship of a claim to the prior art when conducting an eligibility analysis (which is also a ridiculous, terrible idea and has never been the law in spite of some misguided Supreme Court dicta and some obliterated CAFC decisions) then you necessarily want to promote the protecting of non obvious abstractions (facts, information, correlations, logical operations applied to data) because any five year old can write a claim that recites both (a) the prior art and (b) a non-obvious abstraction. Remember that the CAFC has already dealt with this problem in the 102/103 context but they did so (until recently) without explicitly acknowledging that they were dealing with a subject matter eligibility issue. That’s what all the 102/103 cases concerning claims whose patentability hinged on the content of the “instructions” were about (solution: “ignore the instructions” when considering patentability). Also all the cases that hinged on recitation of some “desired non-obvious result” (solution: ignore that “limitation”). You can’t protect “instructions” and “results” with patents. You can’t do it directly (“I claim instructions wherein …” or “I claim the result, wherein …”) and you can’t do it indirectly merely by reciting the prior art and the instructions or the result. And do you know what else? Nobody batted an eye when those decisions were handed down. So, as anyone with a working brain can see, advocating for “no consideration of the prior art during eligibility” is the same as advocating for “you can protect anything as long as you recite some otherwise eligible prior art art in your claim” (which is to say that the latter will flow from the former proposition, inexorably). So please just admit that and be up front about it. Or propose a workable practical solution and demonstrate that it’s workable and practical. Don’t just wave your hands around and cry like a baby that you don’t like the present set-up which is pretty much all that Greg and some other folks around here know how to do. Grow the e f f up, in other words. Stop acting like a Repu k k ke. Own your decisions. The Accuse Others meme is stultifying. “Instead, claim 1 of the ’551 patent covers any means for identifying electronic spreadsheet pages.” So what? identifying electronic spreadsheet pages can hardly be called abstract or a fundamental building block. How does that claim qualitatively differ from Morse’s claim 1, which covered “making use of the motive power of magnetism, … as means of operating or giving motion to machinery, which may be used to imprint signals upon paper or other suitable material or to produce sounds in any desired manner for the purpose of telegraphic communication at any distances”? Labeling, or “identifying” something, or assigning a meaning to something, are all quintessential examples of an abstraction. I call it a hoobernocky. Oh wait, I call it a nooberhocky. What has changed? Nothing, except the abstract meaning I've given it. See how that works? Pretty easy stuff. or a fundamental building block. Identifying stuff and giving it a name is pretty fundamental to understanding and communicating information. “quintessential examples of an abstraction.” Nope. Everyone knows the specific thing it refers to in the context of the claim, which is all that matters. Specificity doesn’t change an abstraction into a non-abstraction. That’s the CAFC’s own precedent (and it’s sensible precedent) which is why this case has no chance of standing up to scrutiny at a higher level. Of course, the defense lawyers need to get on top of all this. Not too difficult, if you ask me. Of course, all the claims are eligible under 101. The courts reasoning is that claim 1 is too broad. That’s a job for 102 and 103. My question is this: When does “a highly intuitive, user-friendly” get recast as obvious? Did you mean that the job is for 112 instead of 102/103? Don’t forget that the interface had “familiar notebook tabs“. Ween. Why don’t you try to do your job instead of getting off feeling better than the inventors because you have a boring job. That does not mean what you may think it means, Ben. Things may be “familiar” in certain aspects without rising to the “keep out” level that any number of patent law sections may impugn. Are you suggesting that those or ordinary skill in the art of spreadsheet software would not have been familiar with notebook tabs? Using tabs with spreadsheets = patent-eligible. Rapid lab test for identifying antibiotic-resistant tuberculosis = ineligible. Two opinions, same day, same court. I am glad the court has its priorities straight. Inventors of tabs must be rewarded! Innovation and investment in the tabbed arts must be incentivized! (cough, cough). I am just as disappointed as you are that Roche went the way that it went, but I am somewhat optimistic here. I think that this panel decision was the prelude to the reconquista of patent law. In the early days post-Alice, various judges wrote plaintive concurrences, hoping that this would prompt the SCotUS to turn a case (Sequenom, Smart Systems, etc) into a vehicle that would be to Alice as Diehr was to Flook. Now, however, that they have found that the SCotUS is not taking these cases, it is beginning to dawn on the CAFC that the SCotUS has lost interest in §101. This is both good and bad. It is bad in that the worst of Mayo/Myriad/Alice will stay on the books indefinitely. It is good, however, in that the CAFC realizes that it can distinguish those cases into obscure insignificance now, and the SCotUS will not interfere. I see Judge O’Malley’s concurrence here as the opening move to start using en banc hearings to effect this distinguish-ad-nihil process. I, for one, will welcome that process with glad heart. We are taking baby steps back toward patent sanity. We are taking baby steps back toward patent sanity. That’s true only in the sense that we are taking baby steps towards the scenario where software patents are ineligible. But that’s not really news in 2018. It is encouraging to think the CAFC could be moving in this direction, Greg. I have glanced at the case – Moocow, which part of the current Justice-written (common) Law of 35 USC 101 do you particularly think is out of line with some (equally unknown) “priority” test? If, on the other hand, you have a legitimate legal point to make as to why one (or the other, or both) decisions are flawed, I would love to hear your reasoning. Claim 3, which was eligible, recited a specific way to implement the solution, and not just the idea of the solution itself. This is consistent with many of the recent cases we’ve seen – claiming a result, even a really revolutionary one, is going to be ineligible; you have to claim the specific way you achieve that result. You know what else is a tab? A physical page of a book. I’m sure it’s entirely unconventional for a book to have two separate spreadsheets, where one references another. I only complain because everyone knows that storing data in a three dimensional matrix is a mathematical construct that long predated 1992. Given that there was no technical problem in mapping a two dimensional matrix to a spreadsheet on a computer, the distinction between the prior art and the claim is adding an additional n-space, which is conventional math. There’s no technical problem here. It’s just as logical to say that adding a second tab (thus letting you go from 2-dimensional matricies to 3-dimensional) is eligible as it would be to add a second tab (thus letting you go from 3-dimensional to 4-dimensional) and call that eligible. It’s eligible turtles all the way down! When the Supremes talk about how fundamental things (like n-dimensional matrices in math) need to be free to everyone, this case is why. There’s an explicit statement that e=mc^2 would not be patentable, but n-dimensional expression apparently is. But my tab goes to eleven. As an examiner in the computing arts, one would hope that you would have a handle on these basic concepts, and be able to incorporate them into whatever viewpoint that you wish to share. “Referencing” here doesn’t simply mean that tab #2 days: “See tab #1 for more info.” It means that when a cell on tab #1 is updated, the values in referencing cells in tab #2 are automatically updated. I don’t recall seeing values in a physical book magically update as other values are changed. I presume that that’s how math textbooks work in the Harry Potter universe, but here in non-Harry-Potter Earth (in 1993), that notion probably had a written description problem. Careful there David, as you appear to be tra shing the canard of Random (but computing is like a book), and everyone knows that Random is one of those “thoughtful” Examiners (he even is an Examiner in the computing arts, so he really must know his Canard Law really well). Little Davey Stein: I don’t recall seeing values in a physical book magically update as other values are changed. That’s because books and computers are different in some respects, Davey. Little Davey learned something today! Isn’t that nice? Now we’re going to teach him something else really deep: like books, computers that “updated stuff as other values are changed” were well-known in the prior art when this junk patent was filed. Little Davey is learning so much! Time for his nappy-nap now. I don’t recall seeing values in a physical book magically update as other values are changed. an actual distinction, that’s not the subject of THIS invention. If “referencing” were sufficient to impart eligibility, then Claim 1 would have been found eligible. Really? Please show me this book that automatically updates. Or are you willingly dropping your inane “this is like a book” meme? Thus there was no “technical problem” in “automatically updating once a referenced cell updates” so while that distinction you draw to a book is an actual distinction, that’s not the subject of THIS invention. Are we arguing novelty or patent-eligibility? Your comment at (3) drew an analogy to “a physical page of a book,” which suggests a problem of novelty or non-obviousness – hence, my reply about how “referencing” in physical books is technically different than a spreadsheet. Claim 12 is not simply directed to displaying a graphical user interface or collecting, manipulating, or organizing information to improve navigation through three-dimensional spreadsheets. Instead, the claim recites a specific structure (i.e., notebook tabs) within a particular spreadsheet display that performs a specific function (i.e., navigating within a three- dimensional spreadsheet). Google avers that humans have long used tabs to organize information. It cites tabbed notebooks, binder dividers, file folders, and sticky Post-it notes as well known examples of organizing information using tabs. Google fails to appreciate the functional improvement achieved by the specifically recited notebook tabs in the claimed methods. The notebook appearance of the tabs was specifically chosen by the inventors because it is easily identified by users. The tabs are not merely labeled buttons or other generic icons. DET has disclaimed as much. Rather, the notebook tabs are specific structures within the three-dimensional spreadsheet environment that allow a user to avoid the burdensome task of navigating through spreadsheets in separate windows using arbitrary commands. It’s an interesting distinction: visual organization of cells specifically as “notebook tabs” is patent-eligible, while functional relationships between cells on different pages is not. * Claim 1 falls into the bin of “generalized calculation” defined by Content Extraction, and so is patent-ineligible. * Claim 12 falls into the bin of “presenting information to facilitate user navigation” defined by Core Wireless Licensing (and, before that, DDR Holdings), and so is patent-eligible. The aspect of the opinion that I find off-putting is the court’s use of the phrase “specific structure and or improvement” to justify its decisions. Why do spreadsheet notebook tabs, as a navigational tool, qualify as a “specific structure or improvement,” where functional relationships across pages does not? This seems very much like a smell test. This seems very much like a smell test. Yes. Exactly. “I know it when I see it” is no way to run a patent system. Except, David, there is NO “settling into bins” because – and precisely because – there has been a nigh constant ping-pong effect going on from one panel to the next. I agree, anon. If we’re going to make a stab at organizing the case law, “bins” is our best bet – but that doesn’t mean it’s a good bet. I maintain what I’ve been writing for several years now: The only way to determine patent-eligibility with confidence is to litigate it to the exhaustion of the legal process. Do you recognize a (rather severe) legal problem with the law as written by the Supreme Court in what you maintain? Something about law being supposed to be not so vague as to be knowable a priori….? This “referencing” is substantially similar to how pointers work link to en.wikipedia.org. Hardly new even in 1992. The method provides a specific solution to then-existing technological problems in computers and prior art electronic spreadsheets. The specification teaches that prior art computer spreadsheets were not user friendly. . . . The “technological problem” was that the computing speed of personal computers put limits on what people were willing to put up with. News flash: this is still a problem. Putting “tabs” on virtual pages, or creating virtual pages with tabs, is not an inventive solution to the “technological problem” of slow computers. It’s a software improvement that a five year old would make if he weren’t constrained by time and money and computer speed (note that none of these things are referred to in the claim — or in most software claims … rather odd, isn’t it??). Also this is totally obvious in view of the prior art which included … tabs for navigating through stuff. 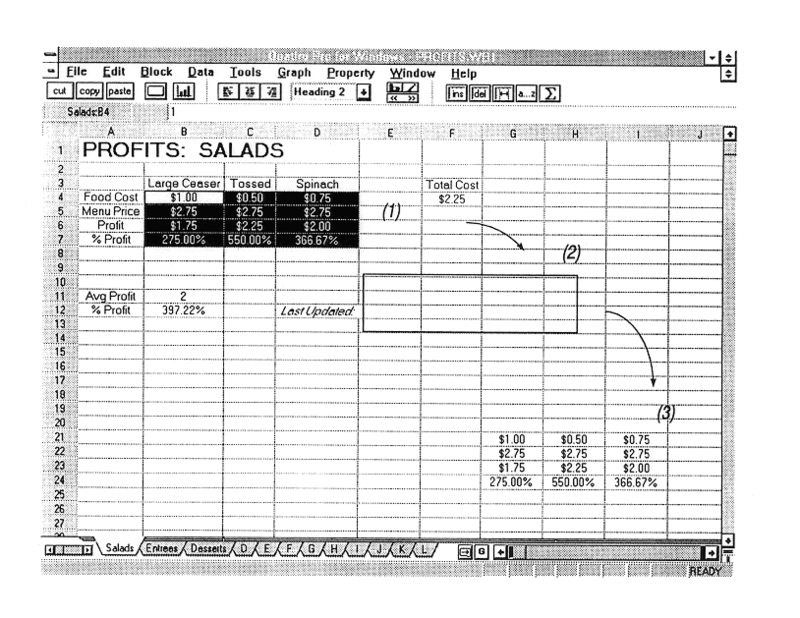 Numerous contemporaneous articles attributed the improved three-dimensional spreadsheets’ success to its notebook tab feature. As I’ve said before, when it comes to the Federal Circuit, as long as there is a computer involved everything old is new again and we all have to pretend that we born yesterday. Here’s an obvious question though: are virtual objects eligible for patent protection? Imagine that the object in question is one that could be made in the physical world and if it were claimed in the physical world it would be eligible (might even be non-obvious and useful). But it’s not claimed as a physical object. It’s claimed as a computer rendered object that can be viewed by the user from all directions. It’s pure vapor. Just signals emanating from a screen or a pair of glasses. Are non-existent “virtual” objects such as this eligible for patent protection? In light of the fact that 3D rendering is old in the art, what exactly is promoted by patenting non-obvious virtual objects? Imagine that the virtual object is, for instance, an animal that you can study (exercise the mind and learn from it) or be entertained by it. What is the “useful art” that is “progressed” by handing out (LOL) patents (?!) on that sort of thing? And why do computers make all the difference (people have rendered things for years using all kinds of rendering technology, including rocks, cave walls, etc ..). My what a lovely strawman you have fashioned out of thin air, and my, how devastating is your own deconstruction of an argument that no one but you have advanced. It’s almost as if you have practiced this argument dozens of times. Here’s an obvious question: does your penchant for wanting the optional claim format of “objective physical structure” to somehow NOT be optional impact your ability to understand innovation or are you simply dissembling, or maybe both? Is the virtual object useful? Is it say a 3D rendering of CAT and/or NMR data that allows the user to view an anomaly from any direction? The sure, its eligible. What art would be promoted? Why the art of rendering information, the art of treating ailments, the art of computing. Ah, so new cookbooks are patentable, too, in Les’s fantasy world. Meet the maximalists: always the dullest sticks in the room. I did pay attention. Did you have an actual point to make that you can articulate in plain English? What you “think” and reality are so very often strangers. The point of course is that you “scold” David and then turn around and pretend that what you scolded David about does not exist. Do you forget that people can read the black and white of what you post? Or do you have such hubris as to think that because you say something that no one would dare to see how hypocritical you are? I’m not sure how you get from what I said, to cookbooks. But if you are referring to a virtual cookbook, that had new features, such as videos that popup to explain terms when you hover over the word in a recipe, then yeah, that would be eligible, why not? No, not at all. I mean, sure, that was (and always will be) a problem, but it has little to do with this. This was about separating out data and calculations in spreadsheets from each other. The way it was done prior to tabs was to keep everything on one massive spreadsheet, with “walled off” sections… So, for example, maybe you use columns A:Z for your biweekly sales totals; and then use columns AA:AZ for sales totals from your Boston office, columns BA:BZ for totals from your New York office, etc.. Then your formulas for the total for column A may be a sum of the totals from column AA, BA, CA, etc. But this gets unwieldy really quickly. By using tabs, you can separate out those sections in a way that makes more logical and intuitive sense. But that’s not trivial, because now your formula might be that column A is based on… column A. And another column A. And more column As. So you need further references to tabs. Putting “tabs” on virtual pages, or creating virtual pages with tabs, is not an inventive solution to the “technological problem” of slow computers. Yes, because it’s an inventive solution to an entirely different problem. It’s a software improvement that a five year old would make if he weren’t constrained by time and money and computer speed (note that none of these things are referred to in the claim — or in most software claims … rather odd, isn’t it??). No, because most software claims aren’t just claiming a solution to slow computers. Also this is totally obvious in view of the prior art which included … tabs for navigating through stuff. Prior art spreadsheets didn’t have tabs. And prior art tabbed navigation systems didn’t need the tabs to reference live data in other tabs. At best, you had tabbed systems (like monitoring systems, for example), that would refer to entirely external data sources. Here’s an obvious question though: are virtual objects eligible for patent protection? Imagine that the object in question is one that could be made in the physical world and if it were claimed in the physical world it would be eligible (might even be non-obvious and useful). But it’s not claimed as a physical object. It’s claimed as a computer rendered object that can be viewed by the user from all directions. It’s pure vapor. Just signals emanating from a screen or a pair of glasses. Are non-existent “virtual” objects such as this eligible for patent protection? I don’t see why not. Say I build a new planetary gear based transmission. That’s a patent eligible machine. Now say I render the exact same thing in a CAD program, and use it to run a virtual car. Why shouldn’t that also be patent eligible? Because it’s cheaper to duplicate? Or say I design a new RF filter with capacitors and inductors and other components. That’s also a clearly eligible machine. But if I design it in SPICE, it’s magically not patent eligible, even though it simulates the exact same components? If a physical world object is patent eligible, then a virtual version of it should be patent eligible for the same reason. And, while this may finally burst the blood vessel in your forehead that we all know is constantly throbbing, Mal, the virtual version of an object may even be patentable over the physical version of an object, and vice versa, because the two environments don’t work the same, and there may be additional non-obvious limitations required for one or the other. Like how tabbed spreadsheets are not like tabs in a paper ledger, but instead provide additional data references for external access. BOOM goes the submariner’s torpedo!